The recent Michael Jackson case has been an incredible Real TV show, with a spectacular blast-off, and less and less convincing moves and elements provided by the Santa Barbara Police as the days go by. We had it all: the live MJ arrestation (with handcuffs), all the available « specialists » who know « many details about the case ». It was presented as a show, just like in the good old O.J days. But what we all should not forget is that this story is about reality. The Michael Jackson 2003 case is about an American citizen who is accused of having molested a young child. It’s about a young boy accusing a superstar. It’s about a family going through a divorce and fighting over the custody of their child. It’s also about what looks like a remake of « 1993 ». It’s actually about too many things to be just summed up in the media the way it has been since the beginning. Geraldine Hughes was Barry Rothman’s secretary during the first allegations, in 1993. Rothman was the young boy’s father’s lawyer (see GQ article by Mary Fisher on this site). She wrote a book Michael Jackson: Redemption: the Truth Behind the Michael Jackson Child Molestation Allegations (Branch and Vine Publishers) to be released next January. So far, her project and her words didn’t get the media attention they actually deserve. Hopefully, this will soon change. Today, she accepts to share her thoughts and feelings and also tells us more about what happened way back in 1993 during the first case. MICHAEL JACKSON data bank : How could you introduce yourself to the fans and the public in general ? Geraldine Hughes : I am the sole legal secretary that worked for Barry Rothman, the attorney that represented the father of the little boy that accused Michael Jackson of child molestation. MJdb : How long did you work for Barry Rothman ? GH : I worked for him before, during and after the child molestation allegations within a six month period, from, I would say, June-July to November of 1993. MJdb : Barry Rothman describes you as a privy person, and says he didn’t need any assistant as he is more into meetings with clients than taking notes. What is your comment about that ? GH : He is absolutely correct. This behavior is abnormal for a law abiding professional attorney practicing law with clients. MJdb : How would you describe the Chandler & Scwhartz families ? GH : At first they were really at odds with each other during the custody battle. But as soon as money came into the picture, they seemed to have joined forces. Afterwards, they began legal battles. MJdb : At what stage did you realize the whole case was a set up ? GH : When Rothman advised Chandler how to report child abuse using a third party without liability to a parent. I thought there was something really unusal about an attorney advising a client as such. MJdb : In your opinion, why did finally Mr Jackson and his camp choose to reach a financial settlement with the family instead of going to the court? GH : Jackson was correct. The legal system was not working for him. He had just lost 4 motions with the court and he should have won 2 of them. Because of the loss, Chandler’s attorneys were preparing to depose him and make him reveal all of his private financial information. Also, the criminal investigators were sitting by to gain access to the information through the civil proceedings, which had less restrictions than criminal. MJdb : What are those motions you mention ? GH : The first main motion was to block the civil case from preceding the criminal case. The second was for trial and discovery preference, which would allow them for a speedy trial with 90 days. A case of this magnitude needed more time to prepare for a defense. Because they allowed the civil trial to precede the criminal, that allowed the D.A.’s office to lay and wait for evidence that would incriminate Michael in the criminal trial; evidence tactics and procedures that would not have been allowed in the criminal case. Michael’s attorneys filed a motion blocking the D.A.’s office from obtaining the information obtained through the civil procedures, and he lost that motion as well. I can honestly say that what was going on in the court system was 95% of the reason why Michael settled. It had nothing to do with being guilty. They also calculated that the trial could have lasted for 8 to 9 months. This would have costed Michael 4 times more than settling because he had high priced attorneys. And there was no guarantee that after spending all that money, the court system would have ruled in his favor. Up until that moment, it was not. MJdb : Mr Jackson said in a 1995 interview that his lawyers advised him to pay adding that « justice may not prevail ». What is your comment about that ? GH : They advised him correctly. It was evident that the court system was in favor of the little boy. MJdb : What do you mean by « evident » ? GH : Two of the motions that the court ruled against Michael were already established precedents that should have been in his favor. His attorneys did an excellent job in presenting to the court the already established precedents that generally don’t allow a civil case to precede a criminal case. It breaches Michael’s right to not self-incriminate which is a protection under the Constitution of the United States. MJdb : When did you get the idea of writing a book ? Why did the title changed from The Set-Up to Redemption ? GH : I got the idea to write the book in 1997. I initially called it The Set-Up because that is exactly what I contend happened in this case. I then decided not to be so obvious with the plot. I decided to let the public read all the facts and make up their own mind. Because of my religious convictions, I preferred not to give light to the devil’s role, but to give light to God’s role in redeeming Michael Jackson. MJdb : What was the research process, does your research mainly focus on your personal notes or does it include other elements and iformations from other persons ? GH : I kept a diary during my employment with Rothman; I also went to the court and got a lot of facts that took place in the court; I recreated the entire child molestation from start to finish and divided the book into chapters dealing with all the major events surrounding the allegation and extortion. MJdb : Why did it take so long to publish the book ? What is the final release date ? GH : It took me from 1997 to 2000 to write the book. I knew that I was going into the mission field in 2001 and did not want the competition of the book competing with the ministry work, therefore, I put the book on hold. My mother constantly begged me to get the book out and even let her find a publisher. I lost my mother last year and in July of this year, I could still hear her voice telling me to get the book out. I decided in 7/03 that I would not stop until I found a publisher. I found a publisher two months later. We have been going through edits for two months and had a release date of January 2004. Now that the new case is pending, and the public is seeking the truth, we are trying to push that date up to the 1st of January. MJdb : I feel that this new scandal is a remake of the 1993 events but in a different context : I think the child’s mother and the child charged Mr Jackson to get a civil case and a financial settlement but the law changed and Jackson’s camp will to go to the court and that makes it all different. Do you think the initial intention of the family in the recent case was to get a financial settlement. What do you think of it ? GH : I think reports are leaking out that the mother was trying to initially get money and when her attempts failed, she is doing the Chandler thing. However, they don »t have the same master minds as before, therefore, it is not as skillfully planned. MJdb : More generally, how would you compare the 1993 case to the new one ? GH : Money, greed, scandal, extortion. Just minus the master minds. That is why they are trying to go the same route (psychologist and same attorney). Difference is, I think Michael want to go to court. I believe if he had went to court the first time, he would have won. MJdb : What can we expect in the next few weeks ? GH : A lot of gossip, false allegations and public scrutiny. I believe their case will fall apart before they can charge Michael. If the D.A. files charges anyway, I believe it will be an indication of spite. I hope they did not plant anything on Michael during the search. MJdb : As a legal secretary, do you think the trial will be fair. What are the options ? GH : Not in Santa Barbara county. That is a prejudice county. MJdb : Can you tell more about this county for the people who may not know it ? GH : We have counties in California that doesn’t have a lot of Black population. Santa Barbara is one. I’m not saying they are prejudice as far as race is concerned, but definitely don’t have too much racial mixture going on. MJdb : What do you think of Tom Sneddon’s behaviour when announcing the charges and his recent apologies ? GH : I feel like everyone else. It was inappropriate and came off just the opposite of what he was stating. MJdb : Can the jury be influenced by external elements and informations not linked to the case ? GH : They are not supposed to and are asked ahead if they can be partial. I think this case has drawn too much media attention to be fair in Michael’s behalf. MJdb : Gloria Allred recently asked that Mr Jackson should not have the custody of his children during the investigation. She made the same request several time in the past. She happened to be in charge of the Chandler case in 1993 but she resigned quite early in this case. Have you ever been in touch with her, and if yes, what can you say about the way she handled the case and her recent actions ? GH : She spent maybe two weeks on the last case and resigned without notice for unknown reasons. I think she should get a life and leave Michael’s alone. MJdb : What are your current projets ? who are you working for and/or what are you working for ? GH : I have since retired from the legal field as a legal secretary/office manager in 2001. I am now currently working as a full-time missionary for underprivileged children. Because I work with children, I know firsthand what Michael is going through. Out of all the activities that we offer our children, their main request is to do « sleepovers. » Children, not Michael, love sleepovers and are more able to pull you into their world, before you can pull them into yours. MJdb : You said God is on Mr Jackson’s side because you were in Rothman’s office 10 years ago and are now able to tell your side of the story. How do you see Mr Jackson’s future? GH : I believe Michael will be vendicated and through it all, he will walk closer to God. MJdb : Do you have a message for Mr Jackson and his fans ? GH : Michael is experiencing a modern day crucifiction because of his message of love and peace to all mankind. He has the call of a mesiah on his life and God has given him, through his talent, worldwide influence. Not for Michael’s glory, but for God to be glorified through Michael. Although Michael is going through the fire now, he will come out as pure gold. I know this is true, because we all had to be tried and tested through the fire before God released his anointing on our lives for His (God’s) glory, not ours. 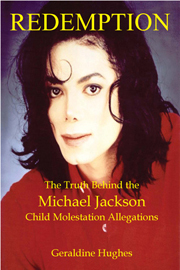 As soon as Michael Jackson : Redemption : the Truth Behind the Michael Jackson Child Molestation Allegations (Branch and Vine Publishers) is finally released, we’ll let you know. In the meantime, you can click here to get direct info from the publisher. Copyright (c) 2003 MICHAEL JACKSON data bank. All rights reserved.